The Little Flower, St. Therese of Lisieux, was born Therese Martin on January 2, 1871 in Alencon, France. 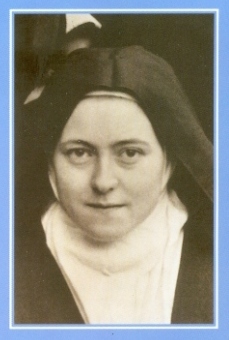 She entered the Carmelite Convent at Lisieux at 15 years old, to give her life to God. Therese took the religious name, Sister Therese of the Child Jesus and the Holy Face. She was gifted with great spiritual insights. Through sickness and dark nights of doubt and fear, she remained faithful to God. After a long struggle with tuberculosis, she died at the age of 24. Her last words were,"My God, I love You!" She was canonized a saint on May 17, 1925 by Pope Pius II and her Feast Day is October first. In 1997 Pope John Paul II declared Saint Therese a Doctor of the Church in recognition of her powerful spiritual teaching. Have a child-like focus and an attentive love for God. Live the words of Jesus, "Unless you become like little children, you shall not enter the kingdom of Heaven." Pray from your heart as a child speaks in a direct, personal and loving way. Although God often seemed distant and prayer offered little consolation, Therese never stopped loving and trusting Him. Do the ordinary things of life with extraordinary love. What matters most is not great deeds, but great love. A smile, a note of encouragement, a phone call, a helping hand are examples of her spirituality. Therese believed that there were sufficient opportunities for pleasing God in our everyday life. "If I find no opportunities, I at least tell Him, again and again, that I love Him." The simplicity and beauty of Therese's spirituality is seen in her view of the world. Theresa saw the world as God's garden and herself as "the Little Flower of Jesus". She considered each person to be a beautiful but different flower in God's garden. The presence of so many beautiful and different flowers made the garden pleasing to God. Because of this beautiful analogy, the title "Little Flower" remained with Saint Therese. My mission--to make God loved--will begin after my death. I will spend my heaven doing good on earth. I will let fall a shower of roses. Roses have been described and experienced as her signature. Many people have experienced her intercession and came to imitate her "little way."